One of the earliest digital garment equipment manufacturing enterprises in the world ,born from north America. The only one listed-company in hanger system industry. Market share rate in the year 2015 is more than 50% in hanger system industry. Drafter of the national standard of smart UPS. --Euratex hanger system is flexible unit production system to streamline the production process and utilize factory premises. --Efficiency-For more than 20 years, Euratex systems has improved production efficiency in various types of industries by minimizing downtime. 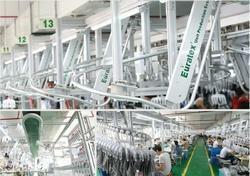 --Euratex hanger system is the most advanced flow management way to optimize your business. What we have is not only equipment, but an outstanding solution for increasing your profitability, returning on investment in less time! Production process can be controlled and adjusted easily in each step to get fast deliveries. One operator can do different styles, different size, different color. Realize auto balance production line, prevent bottlenecks of production. --Euratex has about 100 service car in domestic market. --Remote service system has been established to support the whole world. --Euratex will invest more to set up after-sales service centers in the global market. -Buying a system from us is not really to buy a product. It is to buy a solution and a partnership. Each system includes support, service, training and knowledge built on more than 20 years of experience. We are there for you whether it is about solving problems, adapting your system to new conditions or to increase the capacity of it. Regardless of where in the world you are. In other words, buying a system from us is to start a long term relationship aimed to maximize the return on your investment.